Public Lecture: Sir Jonathan Bate on "Shakespeare's Classical Imagination"
Ben Jonson accused Shakespeare of having “small Latin and less Greek”. But he was exaggerating. Shakespeare was steeped in the classics. Shaped by his grammar school education in Roman literature, history and rhetoric, he moved to London, a city that modelled itself on ancient Rome. He worked in a theatrical profession that inherited the conventions and forms of classical drama. He read deeply in Ovid, Virgil and Seneca. In this wide-ranging lecture, distinguished scholar Professor Sir Jonathan Bate provides ground-breaking insights into the influence of Cicero and Horace, finds new links with classical traditions ranging from monuments to myths to magic to politics, and offers striking new readings of a wide array of the plays and poems. At the heart of the talk is an argument that Shakespeare’s supreme valuation of the force of imagination was honed by the classical tradition and designed as a defence of poetry and theatre in a hostile world of emergent Puritanism. 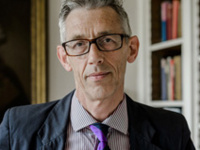 Professor Sir Jonathan Bate – a scholar, biographer, critic, broadcaster, and novelist who specializes in Shakespeare, Romanticism, and Ecocriticism – is arguably one of the most prominent academics in the world. He is one of only five individuals in the history of Great Britain to receive a Knighthood for Services to Literary Scholarship. He has also been named a CBE (Commander of the British Empire) for Services to Higher Education, an FBA (Fellow of the British Academy), and an FRSL (Fellow of the Royal Society of Literature). Currently Provost of Worcester College, Oxford University, Professor Bate is the winner of two of England’s oldest and most distinguished literary prizes, the Hawthornden Prize and James Tait Black Prize (for John Clare: A Biography, 2003); twice runner-up for the UK’s leading non-fiction award, The Samuel Johnson Prize (for John Clare and Ted Hughes: The Unauthorized Life, 2015); also for PEN USA Award for Best Biography of the Year (for Soul of the Age: The Life, Mind, and Work of William Shakespeare, 2009); he has also received the Biographers International Organization Award for Best Biography in Arts & Literature (for Ted Hughes) and the Falstaff Award for year’s best book on Shakespeare (for RSC Complete Works edition, co-edited with Eric Rasmussen, 2006).